Habitat: Fishing port with sea-cliffs, rocky shore and open sea; gardens and other landbird-migrant habitat. Main interest: Nesting Kittiwakes; winter gulls, other seabirds & rocky-shore waders. Regular/near-annual species: Purple Sandpiper, Turnstone, commoner gulls & auks, Iceland & Glaucous Gull (though less frequent in recent years), Arctic & Great Skua, common night-migrants. Scarcer species or rarities: Balearic Shearwater, Velvet Scoter, Quail, Pomarine Skua, Sabine's, Little & Mediterranean Gull, Black Tern, Turtle Dove, Hoopoe, Wryneck, Black Redstart, Golden Oriole, Carrion Crow, Lapland Bunting. Best bird: Indian House Crow (1974-79) – a ship-assisted vagrant, the first recorded in Europe. Access: The most direct route to Dunmore East is from Waterford City by taking the Dunmore road near the Tower Hotel and then following the signposts for 17 km. Access from Woodstown is also straightforward, by taking a left turn at the Fairybush Cross Roads. From Dunmore, the headlands to the east at Foilakippeen and Ardnamult can be reached, with some difficulty, by walking across fields above Councillor’s strand, where car-parking is available. From Dunmore, Creadan Head and strand can also be reached by turning right at Killea church and continuing right from there. Other bird sites along the east Waterford coastline - the coves at Portally, Rathmoylan and Ballymacaw, Brownstown Head and Saleen (at Tramore Backstrand) - can be reached by following the winding road westwards from Dunmore (keep left at White’s pub in Ballymacaw if going to Brownstown/Saleen). 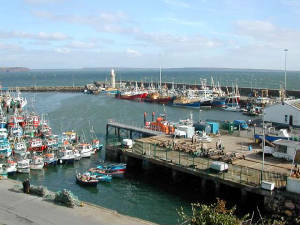 Dunmore East lies at the mouth of Waterford Harbour and is an important fishery port, especially in winter. In the birdwatching world, Dunmore is most famous for its Kittiwake colonies, and none more so than the Inner Harbour colony which can be viewed with ease from the roadside below, even from the comfort of a car. This colony is unique for its proximity to man and is quite an attraction, particularly in summer. There are three main Kittiwake colonies - Outer Harbour, Inner Harbour and Black Knob. The Outer Harbour colony is the largest and the birds can be viewed safely from a number of vantage points at Badger’s Cove and Men’s Cove. Black Knob is the most dangerous of the three and caution is required if Kittiwakes are viewed from above. There are also two smaller colonies, Foilakippeen and Ardnamult to the north-east, both within sight of Dunmore East. The birds are present on nests at the colonies from November to August and a visit during this time is recommended. 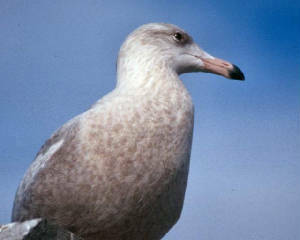 The other prominent breeding species in Dunmore is the Herring Gull, nesting on rooftops of many buildings, including hotels, in the town. Fulmars breed in the cliffs on either side of Councillor’s Strand and anyone carefully watching the Inner Harbour Kittiwakes will also find Blackbird, Dunnock, Wren and Pied Wagtail breeding in the dense vegetation there. Gull numbers fluctuate according to fish-processing and trawling activities and Dunmore East in winter is ideal for both common and scarce gulls. Despite decline in recent decades, Herring Gulls are still usually the most abundant species, but good numbers of Black-headed, Common and Great Black-backed Gulls also occur. Glaucous and Iceland Gulls, scarce ‘northern’ species, were formerly regular in winter but are less regular nowadays. Little Gulls are occasional from September to April, and Sabine’s & Mediterranean Gulls have occurred. The seas and the flat rocks outside the seawall are always worth checking. Turnstone and Purple Sandpipers are regular from autumn to spring – this is the best site for Purple Sandpipers in Co Waterford. Knot sometimes occur, and Common Sandpiper has wintered elsewhere in Dunmore. The waters offshore are worth scanning, particularly during onshore winds, either from the seawall or from the Shanooan carpark above Black Knob. Storm Petrels, Manx Shearwaters and skuas are possible, especially in the autumn, Gannets and auks are likely, and large feeding concentrations of Kittiwakes can occur in winter. Occasionally Great Northern Divers or Common Scoters can be seen, and Balearic Shearwater and Velvet Scoter have occurred. Dunmore East, within close sight of Hook Head, is potentially a good site for landbird migrants and better coverage would almost certainly produce an increase in notable records. 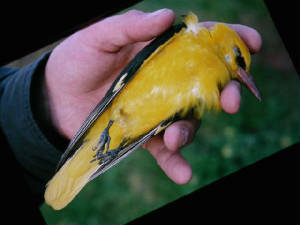 To date, the best landbirds have been a Wryneck near Dunmore East in 1877 (first Irish record), a Golden Oriole in 1994, and the Indian House Crow in the 1970s. The latter is a species from SE Asia that has reached many parts of the Old World by hitching lifts aboard ship; the Dunmore East bird, which arrived in 1974 and survived to at least 1979, was the first recorded in Europe.